Composed by Felix Bartholdy Mendelssohn (1809-1847). Edited by John Michael Cooper. This edition: urtext edition. Stapled. Part(s). Opus 42. 8 pages. Published by Baerenreiter Verlag (BA.BA9074-85). Composed by Felix Bartholdy Mendelssohn (1809-1847). Edited by John Michael Cooper. This edition: urtext edition. Stapled. Part(s). Opus 42. 12 pages. Published by Baerenreiter Verlag (BA.BA9074-82). By Mendelssohn F. Edited by Cornelis. 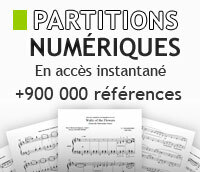 For soprano, 2 tenor, 2 bass soli, SATB, 2222 4230 timpani, strings, organ. (German). Duration ca.20'. Published by C.F. Peters.